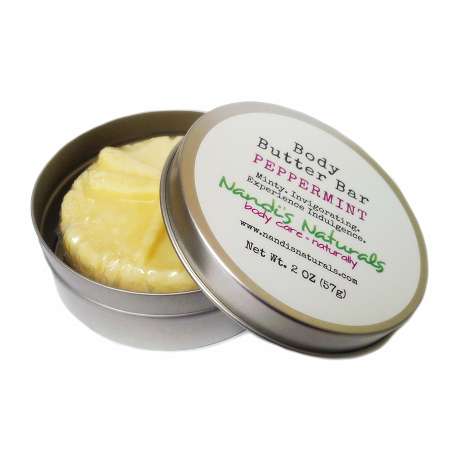 Nandi’s Naturals Peppermint Body Butter Bar makes dry hands, heels and other moisture-deprived body parts a thing of the past. Organic coconut oil creates a moisture base, while cocoa butter and beeswax lock in the moisture. The invigorating aroma of peppermint makes it all worth the wait, so much so, you might wash your hands just to use it again and again and again—since it lasts that long. Our Peppermint Body Butter Bar is the perfect complement to our Peppermint-scented solid lotion sticks and body butters. Nandi’s Naturals body bars come in handy, decorative tins that can be slipped into your purse or placed right next to the bathroom or kitchen sink. Perfect for expectant mothers, our body bars make for an unforgettable belly rub or foot massage. I really love nandis natural lotion. it feels so good on the skin!